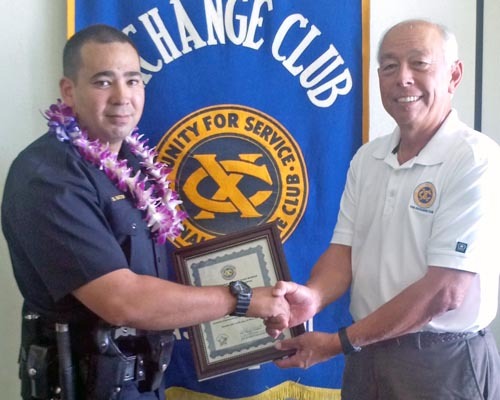 Hilo Exchange Club member Joey Estrella congratulates May "Officer of the Month" Jared Cabatu. 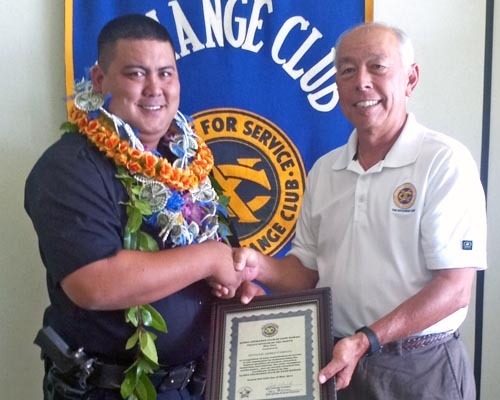 Hilo Exchange Club member Joey Estrella congratulates April "Officer of the Month" Shea Nactor. The Aloha Exchange Club of East Hawaiʻi recognized Puna Patrol Officer Shea Nactor as “Officer of the Month” for April and South Hilo Patrol Officer Jared Cabatu as “Officer of the Month” for May. Both men were honored Thursday (May 24) at a luncheon ceremony at Coqui’s Hideaway in Hilo. Nactor was recognized for his investigation of a sexual assault that occurred during a sporting event in Puna. Due to the nature of the crime and the unavailability of other officers at that moment, Nactor volunteered to stay after his shift ended to meet with the victim. He was able to quickly obtain an accurate description of the unknown male suspect and relay it to other responding officers before the sporting event ended. As a result, the suspect was quickly identified and located. The case was turned over to the Juvenile Aid Section. Sergeant Robert Hatton, who nominated Nactor for the award, said the officer showed patience, compassion and professionalism when dealing with the victim and her family and had a “compassionate demeanor” that had a calming effect on them. “Without Officer Nactor’s attention, compassion and thorough investigation, the suspect may have never been identified,” Hatton said. Cabatu, who joined the Hawaiʻi Police Department three years ago, was recognized for investigating a series of financial crimes. In January, a woman discovered that someone had stolen her credit card and then used it to make 11 unauthorized purchases totaling more than $2,000. According to Sergeant Allan Watanabe, Officer Cabatu volunteered for the investigation—knowing that financial crimes can be very complicated. His efforts led to the identity of a suspect, who turned out to be a friend of the victim’s grandson. The 20-year-old suspect was eventually charged with 15 felony offenses. The East Hawaiʻi “Officer of the Month” award is a project of the Aloha Exchange Club of Hilo.